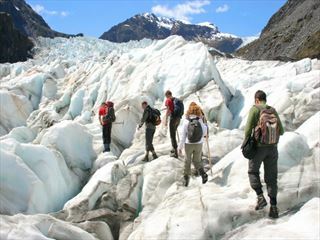 Take this small group tour to experience New Zealand on your own terms. You’ll enjoy 17 days of exploration on a private air-conditioned bus taking you across both the North and the South Islands. On arrival you’ll be met at the airport and transferred to your hotel in the center of Auckland. The rest of the day is yours free to relax or explore the city. Some options include taking a look around the Auckland Museum, visiting the cafes and restaurants of Viaduct Harbor or taking a ferry to Waiheke Island. Today you’ll depart from Auckland and head to Muriwai Beach on the West Coast. Here you’ll take a short walk to allow you close up views of a gannet colony which nests on the cliffs. You’ll then continue northwards to the Matakohe Kauri Museum which looks at the history of New Zealand’s towering kauri trees. Next you’ll head north to the impressive Waipoua Forest. Accompanying a group of young Maori who are dedicated to preserving the traditions and culture of their tribe, you’ll be given a full understanding of this unique forest. In the evening you’ll reach Omapere where you’ll have dinner at your hotel. 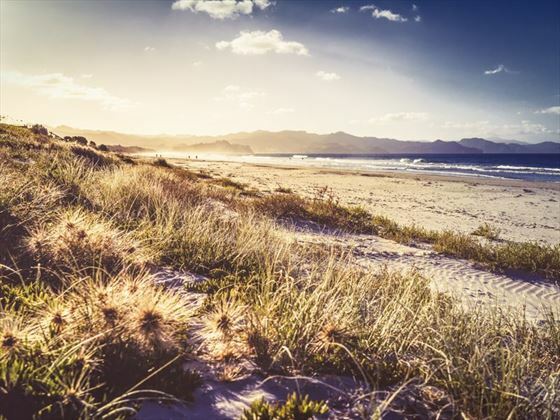 In the morning of day three you’ll cross Hokianga Harbor so you can explore the sand dunes. These impressive dunes are up to 500-foot high and if you’re feeling the need for a little adrenaline you can ride a body board down the sand. Afterwards you’ll catch a ferry to Kohukohu where you’ll drive to Kerikeri, the North Island’s fastest growing town. 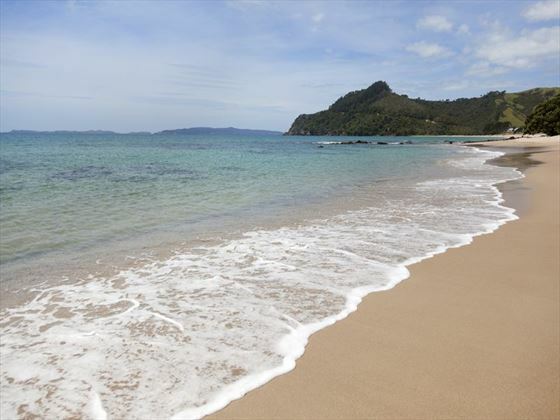 Finally you’ll reach the famously beautiful area of the Bay of Islands. You’ll be treated to remarkable views of many small islands contain in an expanse of shimmering blue water. Today you’ll take a cruise from Paihia into the truly stunning aquatic landscape of the Bay of Islands on a catamaran that is purpose-built to make it ideal for dolphin viewing, or alternatively you can cruise out to the Hole in the Rock. Afterwards you’ll disembark at Russell, the first capital of New Zealand and take in the pretty colonial buildings before re-boarding your coach and driving Flagstaff Hill for some unforgettable views. Finally you’ll head back on the ferry to Paihia. Today you’ll visit the Waitangi Treaty House where the Maori signed a treaty with European representatives – a very significant point in the history of the country. You’ll then head onwards to the Waiomio Valley where you’ll take a guided tour through the Kawiti Glow-worm Caves with the descendants of the famous Maori chief, Kawiti. End the day with the journey back to Auckland where you’ll have a little more free time. Today you’ll continue driving south over the pretty Bombay Hills and through the Hauraki Plains offering pretty views of the Coromandel Peninsula. Here you’ll have lunch at the Rapaura Watergardens and a take a bush walk. Heading north to Coromandel you’ll learn a little of the town’s gold mining past. 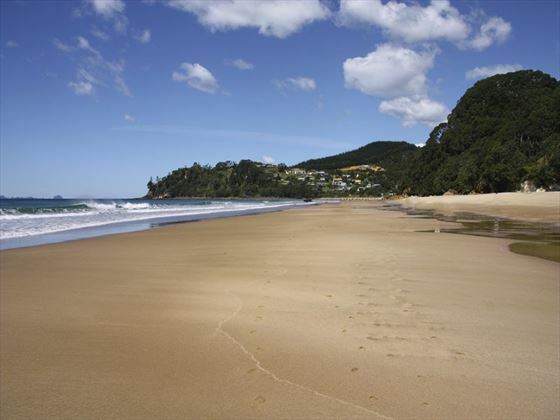 You’ll also get the chance to see some of New Zealand’s most impressive beaches including Whangapua, Matarangi, Kuaotunu and Otama. You’ll start the day by taking a ferry ride across the Whitianga estuary where you’ll be picked up by your coach. You can alternatively opt for a glass-bottom road ride to Cathedral Cove, a truly lovely beach. Heading onwards you’ll visit Hahei Beach and the impressive Hot Water Beach, where natural hot springs means (with a favourable tide) you can dig your own hot tub in the sand. You’ll then continue through Whangamata and Waihi to Rotorua. Here you’ll receive an introduction to living Maori culture with a private tour of Ohinemutu Village. Today is a relaxed day in the wonderful city of Rotorua. After breakfast you’ll take a cruise on Lake Rotoiti where you’ll explore quiet coves, swim in the lake, relax in secluded hot pools and even get the chance to take the helm of the catamaran. Heading back to dry land you’ll enjoy an exclusive lunch at Pounamu Lodge – the hosts will provide fascinating stories of their ancestors. 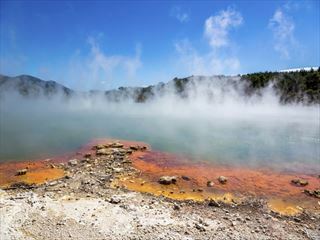 Later on you’ll return to Rotorua where you’ll visit the fantastic museum which contains a huge range of cultural treats. 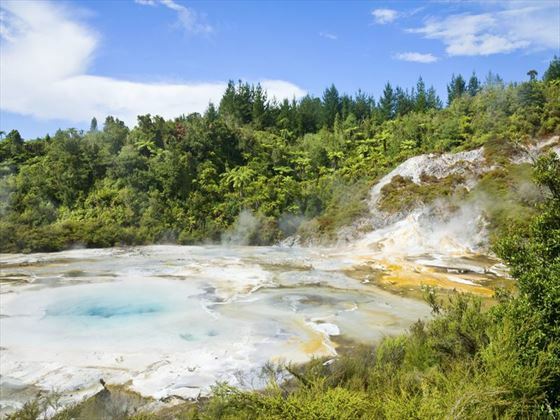 Today you’ll visit a lovely geothermal spot called Orakei Korako. 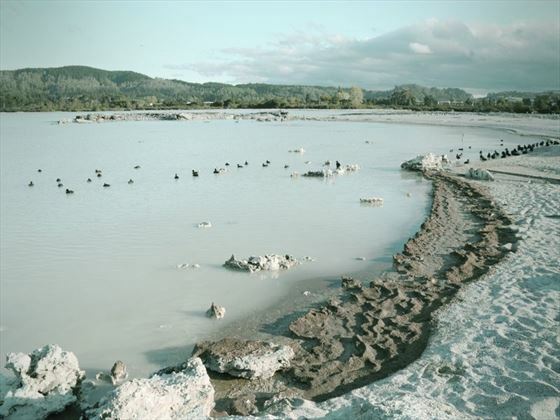 Cross the lake and you’ll be treated to some impressive silica terraces and bubbling mud pools. Take in the Huka Falls and enjoy views of three active volcanoes: Tongariro, Ngauruhoe and Ruapehu. You’ll then head towards the town of Napier, famous for its Art Deco architecture and proximity to great vineyards. You’ll head out ion a wine tour, sampling some of New Zealand’s best wines. 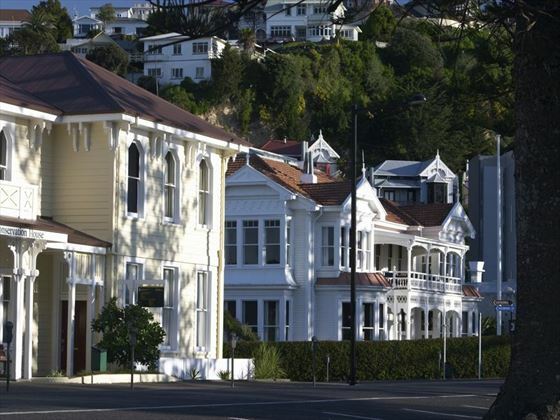 Then you’ll take a guided tour of the city of Napier, exploring the suburbs. Today you’ll drive to Havelock North and the onwards up to Te Mata Peak where you’ll be treated to stunning views of the region. Then you’ll head through the picturesque Hawkes Bay, lined with vineyards, farms and orchards. See New Zealand’s famous national bird, the Kiwi, at Pukaha Mt Bruce Wildlife center before heading on to the capital city of Wellington. Here you’ll take a city tour then check in to your hotel for relaxation time. 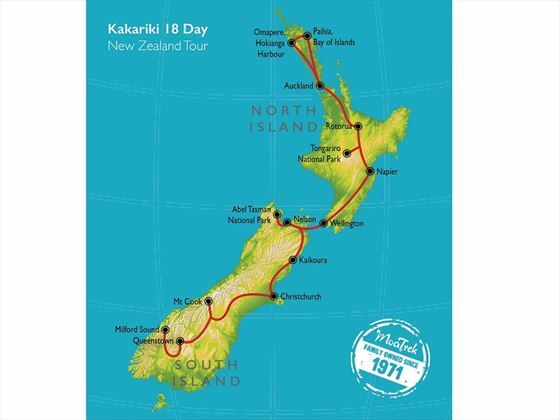 On day 11 you’ll switch from the North to the South Island, catching the Interislander ferry for the scenic three-hour journey across the Cook Strait. You’ll cruise past the pretty Queen Charlotte Sound to Picton. Back on dry land you’ll tour Marlborough, New Zealand’s top wine and food region. 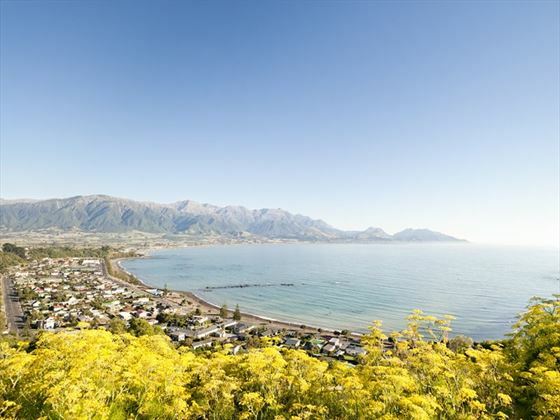 You’ll then head off from Marlborough journeying south to the town of Kaikoura, which sits beneath the wonderful Kaikoura Mountains. In the morning you’ll take a two-and-a-half hour tour to encounter the Albatross. As well as these huge birds you’ll also see penguins, gannets, shearwaters and a variety of other birdlife native to New Zealand. Later you’ll have an afternoon at leisure where you can visit a seal colony or opt for a whale watching cruise or flight. Today you’ll follow the highway down the coastline to the Canterbury Plains. Here you’ll enjoy some of the legendary Kiwi hospitality as you enjoy a special lunch at the Akaunui Farm homestead. You’ll then continue your journey passing the irresistible Lake Tekapo and stopping for photos before heading onwards to your hotel at Mt Cook. You’ll wake on day 14 directly beneath the towering Mt Cook, New Zealand’s highest mountain. 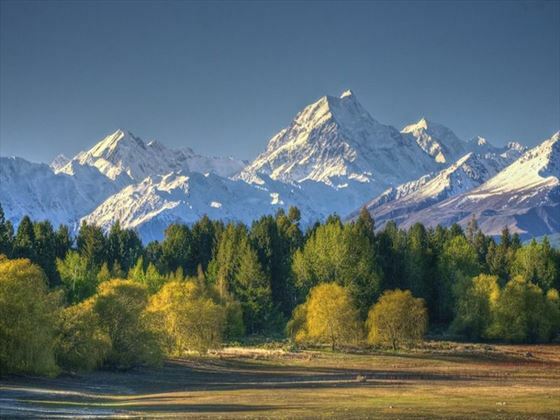 Known in Maori as Aoraki, you’ll take a walk through the area before heading down to the Mackenzie Basin, through the stunning scenery to Queenstown. Here you’ll ride the Skyline Gondola to the summit of Bob’s Peak for wonderful views of the city. You’ll then travel on to your hotel, based a few minutes from Lake Wakatipu and The Remarkables range. 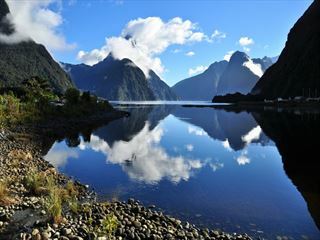 On day 15 you’ll travel up to Te Anau, gateway to the gorgeous Milford Sound in the Fiordland National Park. Once you arrive you’ll head out on the Sound in a boat, cruising around the area with an on-board nature guide. As you explore the water your guide will help you get to know about the wildlife here as well as point out some impressive sights such as the iconic Mitre Peak. You’ll return to Queenstown on a wonderful scenic flight. 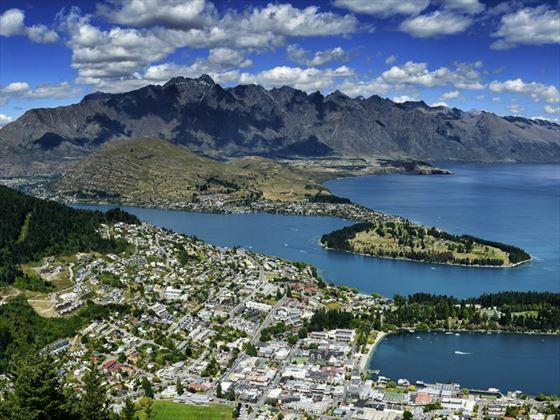 On day 16 you’ll enjoy a day at leisure in Queenstown itself, known as New Zealand’s Adventure Capital. Here you’ll find a huge range of activities include tours to the Lord of the Rings movie locations, thrilling white-water rafting, jet boats on Shotover River and placid Botanic Gardens. After a breakfast at leisure you’ll be picked up from your hotel and transferred to the airport for your flight home.